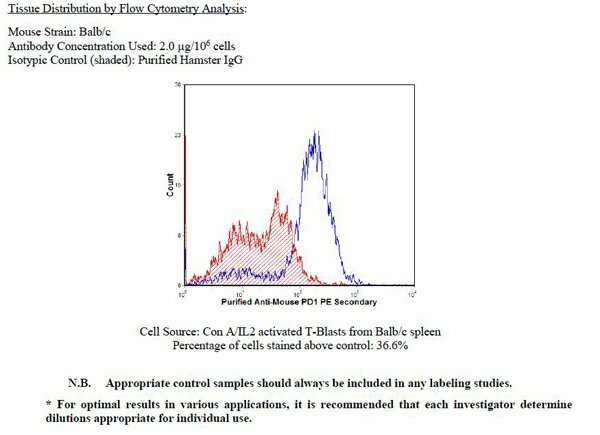 Biotin/FITC/PE conjugated IgG buffered in PBS, 0.02% NaN3 and EIA grade BSA as a stabilizing protein to bring total protein concentration to 4-5 mg/mL. For all formats, store at 4 degree C. DO NOT FREEZE PE conjugates. For long term storage (Purified, Biotin, FITC), aliquot and freeze unused portion at -20 degree C in volumes appropriate for single usage. Avoid freeze/thaw cycles. Small volumes of anti-PD-1 (CD279) antibody vial(s) may occasionally become entrapped in the seal of the product vial during shipment and storage. If necessary, briefly centrifuge the vial on a tabletop centrifuge to dislodge any liquid in the container`s cap. Certain products may require to ship with dry ice and additional dry ice fee may apply. PD1 monoclonal antibody reacts with mouse PD-1 (programmed death-1), a 55 kDa member of the Ig superfamily that has been demonstrated to play a key role in the regulation of immune response and peripheral tolerance. PD1 is expressed on activated T and B lymphocytes. This antibody is suitable for use in flow cytometry.